-Beautiful beaches, with excellent breezes for water sports. -Delicious cuisine, from local cider to galette pancakes. -Spacious cottages sleeping four to six guests. Located on the northwest coast of central France, Brittany is ideally placed for those wanting to enjoy a relaxed holiday on the sunny beaches of this coastline of France. 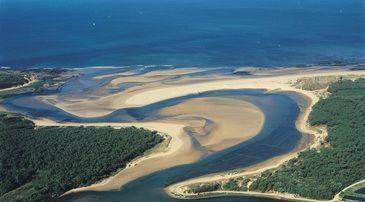 Here the waves of the Atlantic lap the golden beaches of France, with the stunning Armorique Regional Park found nearby to Brest. Guests can enjoy everything from hiking and cycling to horse riding, and exploring the many pretty seaside villages in Brittany. Alternatively, take part in the many water sports on offer or soak up some history in one of the towns. Home to beautiful towns and cities including Rennes, Vannes, Brest, St-Malo and Saint Brieuc, there is lots to be explored in this tranquil region of France. Those wanting to drive or arrive by ferry from the UK will find it easy to reach. Bring your own car and explore this beautiful region at your own pace, take advantage of the many car rental companies or use the easy to grasp public transport options of the area. 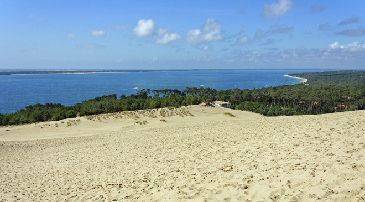 Alternatively, the Île d'Arz and the Île-aux-Moines, as well as 30 smaller islands, are easy to reach from Brittany and provide a relaxing day in the sun. The tranquil area of Brittany is ideal for those wanting to explore their stunning surroundings, with many outdoor activities on offer. Walking and hiking are popular activities in the area, with much to be explored. Cap Fréhel is a pretty French lighthouse perched on top of the cliffs, along from St-Malo on the north coast, with unparalleled views across the English Channel. Alternatively, Pointe de Pen Hir is a gorgeous rugged headland perfect for coastal walking from the Armorique Regional Park. For something more challenging, visitors can also try hiking to the top of the Monts d'Arée hills, offer rugged landscapes with interesting flora and fauna, and can also be reached by mountain biking. Those interested in the more human history and culture of the Brittany area should head to Fort la Latte, which is a stone fortress built in the 14th Century and offers panoramic views out to sea, a maze and some stunning grounds to be explored. Alternatively, Quimper Cathedral has dramatic twin spires in an excellent example of Gothic French architecture, while Château de Vitré is a stunning building, often likened to some of the incredible architecture found in Romania. For prehistory and some interesting sights guests can also visit the 6000 year old Carnac Stones, and the Locmariaquer Megaliths which date all the way back to prehistoric times. Families will find plenty on offer in Brittany, with attractions and facilities well suited to children. Pack a picnic and explore the surroundings or head to the zoo for the day. The Zoo and Botanical Garden of Branféré is home to giraffes, monkeys, polar bears, pelicans, parrots and some animals which can be petted, including kangaroos. Adults can admire the stunning architecture of the main building, with the botanic gardens ideal for a stroll, keeping eyes peeled for birds, monkeys and other animals that live in the grounds. There are also tree climbing courses for the little ones. Alternatively, get up close and personal with some colourful fish and exotic animals at the Great Aquarium of Saint Malo. Here guests can wonder at the fish tunnels, get up close to the sharks and turtles, and even enjoy a dining experience as jelly fish and sharks swim above your head. Water sports are a fantastic way to engage your thrill-seeking side during a holiday in Brittany. Guests can enjoy a wide range of activities on the beaches and enjoying warm breezes ideal for kite flying, kite surfing, sailing, wind surfing and more. Alternatively, explore a smooth underwater world with snorkelling or scuba diving trips, or simply make the most of the warm golden sands with a day of sun bathing and paddling. Families will find plenty of beaches for them, with Blue Flag status beaches offering clean sands, restaurants and other facilities, as well as secluded bays sheltered by the cliffs and shallow waters ideal for paddling. Those wanting to enjoy more relaxing activities and sports during their stay in Brittany will enjoy the range of golf courses available in the area. With the lush surroundings and undulating grounds of the area most offer spectacular views along with your game. Fishing is another perfect way to enjoy the serene atmosphere, with tasty fish to catch. Some restaurants will even serve up your catch with delicious pommes frites, salads and fresh local produce on the side. Brittany, like most other regions in France, does eating and drinking exceptionally well, with delicious local favourites on offer in most of the restaurants. The seafood is caught fresh in the area, with prawns, langoustine, oysters and mussels firm French favourites  moules frites is a delicious choice, served with crusty bread and white wine. The fruits de mer are fabulous platters of the shellfish catches of the day, with homemade mayonnaise and fresh lemon. Alternatively, galettes and crêpes are a French must and come with a wide range of fillings, including creamy local cheeses with salty ham, or sweet lemon and sugar or Nutella. Other traditional French options abound, including charcuterie dishes, fine wines, cakes, pastries and other delicacies. Some of the best restaurants to try in Brittany include Le Ty Rétro in Quiberon, which serves an excellent range of crepes and galettes. Guests can try range of fillings, including a fried egg and sausages, salmon and cream cheese, bananas and peanuts, and a full fry up, all at reasonable prices. Salon de Thé Bergamote Saint Malo is ideal for delicate French pastries, strong coffee and nice teas. Maison Bleu Lin in Dinan serves coffee and tea, scones, cakes, jams and traditional sweets, while Le Genty Home in Tinteniac offers delicious fresh scallops, fine wines, moules and other delicacies from the area. Brittany is a gentle, touristy area of France, home to cosy local bars and restaurants, which stay open until late. There are a few clubs, but the nightlife is quiet throughout most of the region. La Dame Blanche can be found in Port Louis and offers delicious local wines and beers, while La Rhumerie in Dinard serves rum-based cocktails with excellent music. Alternatively, Le Coota is in Erdeven and offers friendly staff, a vibrant atmosphere and delicious exotic cocktails. 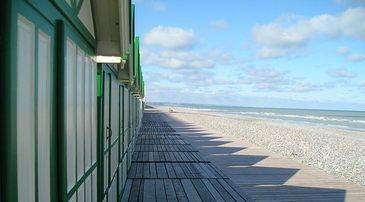 Most of the larger towns and resorts in Brittany offer summer camps, schools and recreation centres for children. They'll enjoy a range of activities, while families with younger children will also find nurseries available. Most of the tourist offices will also be able to provide visitors with a list of qualified local babysitters. Parking in Brittany is easy in most of the larger towns, with covered car parks available, as well as some free parking on the streets. Most hotels and apartments also offer guests free parking facilities.